Radiation use efficiency values estimation based on the biomass increment (one approach) and on NPP from eddy covariance (two approaches) estimation of NPP brings the values of 0.13, 0.40, and 0.47 g (C) MJ −1 , respectively. The productivity of terrestrial ecosystems is primarily reliant on the absorption of solar radiation energy and its conversion into biomass. Monteith (1977) first introduced the concept of radiation use efficiency (RUE), which expresses the effectiveness of a plant stand to use solar radiation for the formation of new biomass and to maintain existing biomass. 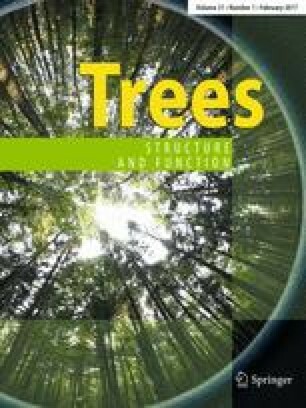 The presented paper uses a long-term, decadal, time series of biomass data, which is based on forest inventory data and an allometric relation, and on the application of eddy covariance (EC) estimation of Net Primary Production (NPP). These approaches provide different values of light use efficiency (LUE). LUE is based on direct carbon exchange estimation, LUE i , which denotes instantaneous efficiency based on the relationship between the daily sum of incident global radiation (GR i ) and NPP and LUES, calculated as the ratio between the sum of NPP and the sum of GR i per growing season. RUE is based on direct yearly biomass increment expressed in carbon units (carbon = 0.5 × biomass) divided by the sum of GR i per year. The obtained values amount to 0.13, 0.40, and 0.47 g(C) MJ−1 for RUE, LUES, and LUE i , respectively. The higher value of LUE i reflects a direct relation with the efficiency of photosynthetic carbon pumping. In contrast, the RUE value, based on biomass inventories, is the result of woody mass formation that is caused by several mutually related physiological processes and “wastages” of radiation utilization. This work was supported by the Ministry of Education, Youth and Sports of CR within the National Sustainability Program I (NPU I), Grant Number LO1415 and within the CzeCOS program, Grant Number LM2015061. Authors thank Alice Dvorská for the initial cooperation and useful remarks. We also thank Ryan McGloin for valuable language corrections. All benefits from a state or commercial party related directly or indirectly to the subject of this manuscript and to the authors are acknowledged.